After pulling a lot of strings, we got a chance to meet with Bob Herdman of Audio Adrenaline after their show at Harvest Crusade '99 in Philadelphia, PA, where Third Day and Jennifer Knapp also played before them. Bob is currently one of Audio A's guitarists and songwriters. While transferring the interview from mini-audio cassette to this page, we tried to include as much of what went on and what was said as possible. John's girlfriend Amy and friend Frank were also present during the interview. Jesus freak Hideout (John DiBiase): How did you guys come up with the name, "Audio Adrenaline?" Bob Herdman: Mark, Will, Barry and I were in college together- it was Kentucky Christian College - and about a year before we ever did the band, I was with a bunch of guys and we were in our dorm jumping up and down on the bed listening to the stereo playing air guitars and the name actually popped in my head. Actually in Ezekiel 32, there's the Hebrew word for- nah, I just made it up. *he grins* It just popped in my head one time. So it's just a cool name and then a year later we started a band. I said, "You know I got this cool name I thought of a year ago, it's called 'Audio Adrenaline.'" And everybody said, "Oh, that's cool! Let's call our band that." So that's it. There's no deep Spiritual meaning to it. JFH (John): How would you describe your sound? Bob: I'd say pop/rock. Yeah, pop/rock is what I think we'd call it. Bob: Oh boy! It's all different, y'know, I grew up listening to Christian music. Some of the other guys did, most of them didn't. *he pauses* I don't know really. What are the influences...? For secular music, I like things like Beck and the Beastie Boys. Music like that. I don't think we really sound like those but I kinda like those. And other people like different things. I grew up listening from things like Johnny Cash to Petra to the Rolling Stones. So it's all different stuff. Pretty much just rock and roll. JFH (John): What kind of Christian bands do you listen to now? Bob: Well, Considering Lily is my favorite 'cause my wife's in it. I started out listening to Prayer Chain. When they first started, they were my favorite Christian band. Actually my second favorite. 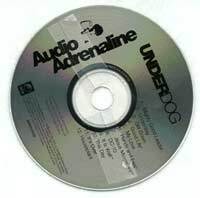 Audio Adrenaline's the first. *big smile* But man, I don't know. Who's my up and coming favorite? I like Mukala, it's kinda cool. He's kinda like Beck, kinda. *Mark Lee of Third Day walks by and whispers "Third Day"* Third Day! I love Third Day. They got a new record coming out too. Actually, on our record label we've got a guy named Riley Armstrong. He's kinda like a cross between Beck and Steven Curtis Chapman. So I really like him a lot. We have a record company, Flicker Records, so he's the first artist on it. I'm really excited. I mean I really love his music. It's really cool. I guess we wouldn't have signed him if we didn't like it. JFH (John): Your new album, "Underdog," releases next month. A distinct change can be heard. Can you tell us a little about what you guys did differently on this album? Bob: I think we just wanted to have more fun, y'know. Not take this music so seriously and just make songs that people like. Y'know, that's what we like. We're pretty much just a pop/rock band, a good time, youth group band. Like the Rolling Stones is compared to secular music. It's just good time rock and roll, I think. JFH (John): Who is the little boy on the cover of Underdog? 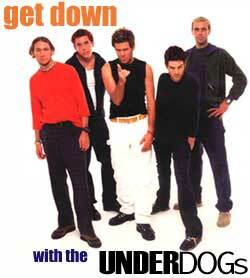 JFH (John): What inspired the song, "Underdog?" Bob: Well, there's two parts, we've always felt a little bit like underdogs. Cause we've always felt we're not really the greatest band. We're not the greatest band. We'll be honest with that, we're not the greatest band. Musically and talented- we're not the most talented. We write some good songs, I think God's blessed us with that. We're not the best singers, best looking, the best anything. But God has blessed us. But we've always felt this thing that we're the underdog. But God's always blessed us because of it. And then also, on the other side of the story, a lot of the time people look down on Christians as underdogs. Sometimes they think you're weak because you give your life to somebody else. But you know we know we're not. We're just the opposite. God's empowered us because we've become less for Him. JFH (John): What made you guys remake "DC-10" and in the swing style? Bob: It's just like this cult following of people that like that song. That and "My God." And that was the first song Mark and Will and Barry and I did -- Barry's not with us anymore, but when we first started like 10, 11, 12 years ago. Actually, maybe it was 10 years ago. And I don't know, we just wanted to do something that kinda touched back with our roots, our very beginning. We were gonna do it like the Beastie Boys- more modern stuff. But then we wouldn't be able to do that as good as Beck or Mukala or somebody does. So let's just think of something totally crazy and zany. We were just goofin' around and the swing thing came around. Swing's such a big thing and we thought we would just make a joke of it. And do our song swing. Do you like it? *Amy chimes in, "I love it! "* You do? We played it live one time and it just didn't go over well. I think we have to wait until people hear it. Like "Mighty Good Leader" and "Get Down" go over really well which no one's ever heard. But "DC-10" didn't go over real well, so we'll see. If people really like it, we'll probably work it up again and do it live. It was fun to do. JFH (John): What is the song, "It's Over" about? Bob: Basically, it's like tonight, when we leave the show tonight. It's more like a live song that we'll probably use at the end. - 'It's over. When the lights are out, don't loose your glow.' Like everybody's always pumped up at church camp or they're pumped up at a youth event or they're pumped up at a concert about God. But once it's over, you go home and then the next day you're kinda back to your old routine. So it's just like, 'it's over, it's time to leave, but don't lose this zeal and this awe of God that you have and just this on-fireness.' And that's basically what the whole song's about. JFH (John): What does the future hold in store for Audio A? Bob: Well, we got this new record coming out. We're gonna go on tour in the spring. Mark and Will and I have a record company called Flicker Records. That's our big thing right now and we're working on getting our new artist done. We're working on signing a new contract with somebody, either Forefront or some other record company that we don't know. We hope Forefront if we come to an agreement on things. So it's like that, and y'know, the Bible says, "Don't count on anything," but if we had to plan, that's what we'd plan on. God may have other plans for us. We may all be missionaries in Haiti next year, y'know? But that's our simple plan. JFH (John): What is favorite Audio Adrenaline song? Bob: Let's see... All time favorite? Probably "We're a Band," if I had to pick one. I mean there's a lot of them I really like. But probably "We're a Band's" most fun to play. Our new one, "Mighty Good Leader's" fun to play too, but probably "We're a Band's" my favorite right now. We still do it live almost every show. JFH (John): What is your favorite movie? Bob: I don't know. I hardly watch TV anymore or movies. I used to be in the Army, I used to be a big "Apocalypse Now" fan. I just love all that war stuff. *Amy jumps in, "You were in the Army? "* Yeah, for like four years a long time ago. I don't know what my favorite one is now. I don't know. Favorite movie... *gets real thoughtful* You know what, I like, like "Lawrence of Arabia." Stuff like that. I just love military, history-- I love history stuff. Sagas like that. JFH (John): Do you prefer Surge or Mountain Dew? Bob: Uh, Mountain Dew. But I used to be a total Mountain Dew addict and about five months ago I quit. I'm like 33 and I'm like 'Y'know, I gotta start drinking diet drinks.' And I hated Diet Mountain Dew but I like Diet Pepsi. So, I mean, I drank Mountain Dew for 20 years, like 6 cans a day. When we were on tour, that's all I drank. But I haven't drank Mt. Dew, literally, in like 5 months. I bought a Diet Mountain Dew last week. *We offer him some that we have, being avid supporters of the drink* Nah, I gotta drink diet drinks now. I'm getting too old. *Amy proceeds to ask, "Is it because it puts weight on? * Well, no it hasn't yet but I figure it's going to so I'll just get a head start. Y'know, it's just when you get old- everybody drinks diet. So I figure I might as well too. Be cool. JFH (John): Are there any last comments that you want to make? JFH (John): When did you make the transition from keyboards to guitar? Bob: About almost 2 years ago full time. I've been playing guitar for like maybe 7 years. 5, 6 years maybe, I don't know. But it's a lot more fun. I was never a very good keyboard player. When we first started, I didn't play anything. I just wrote lyrics. So Barry taught me some chords playing the keyboard. I'd learn them but I hated it. I was just like a road monkey. *gives his impression* I learned a little bit as I went a long, but the guitar is much more fun. It's easier. I learn it a lot faster and I know it a lot better than keyboard. Most guitar players are cooler than keyboard players. That's the main thing. That's what it's all about. JFH (John): What inspired the song "Houseplant?" JFH (John): Tell us a little about the video you recorded for the song "Hands and Feet" and your experience in Panama? Bob: We recorded the "Hands and Feet" video in Panama in the Darion Jungle with some native tribes there. It was very interesting that we actually stayed in grass huts on the dirt floor the time we were there. It was very primitive and not a nice place to stay but the video turned out beautiful. We hope this song will encourage people to become more involved in missions.